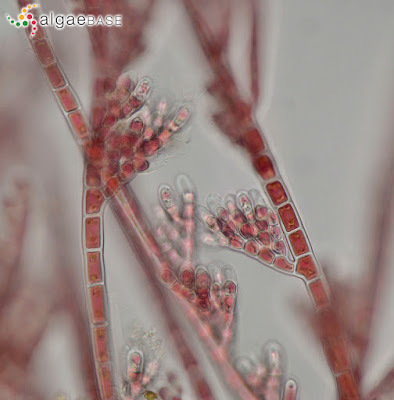 Microscopic view of Colaconema daviesii, copyright Ignacio Bárbara. Colaconema is a genus of filamentous red algae indicated by molecular analysis to be phylogenetically distant from other members of the Florideophycidae (Harper & Saunders 2002). Characters (from Harper & Saunders 2002): Marine algae composed of monosiphonous simple or branched filaments; cells with one to several parietal plastids of varying shape (lobed to spiral to irregular), with or without pyrenoids; plants primarily reproducing asexually by monosporangia; sexual life histories, where known, triphasic.